Cardio Collection Festive Scene Clear Stamp Set; a lovely collection of 28 sillhouette designs to create stunning festive scenes. 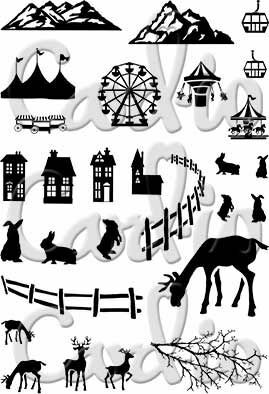 Stamps include mountain ranges, circus tent, ferris wheel, fairground carousel, fairground swing seat ride, various houses, cute rabbits, fences, large and small deer and a wintery branch. 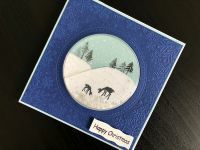 This is such a versatile collection that wll make superb Winter and Christmas cards but that could be used all year round. Overall size 10 x 14.5cm or 4 x 5.5 inches.